I am so thankful that we've had such a mild winter, but even so, I'm getting antsy for spring and summer. And more specifically, I'm getting antsy for a tropical vacation. Alas, this dinner is as close as I'll be getting for a while, but it will have to do. 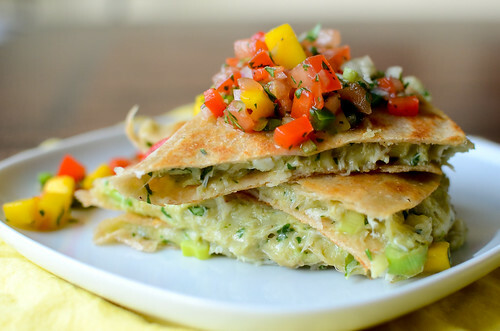 I've made a lot of quesadillas in my day, but these rank up there as some of my favorites. The crab and avocado go really well together, and the sweet-spicy mango salsa is a perfect complement. The avocado is mashed up, then the crab, some Monterey Jack cheese, and a few herbs and spices are mixed in. So you basically make a "crab guacamole." Which sounds kind of weird and maybe a little disgusting, but when I tasted it to adjust the seasonings, I pretty much wanted to just grab a bag of tortilla chips and go to town. The mango salsa comes together really quickly, and this recipe makes more than you'll need - I trust that you can find something to do with the leftovers though (see above comment re: tortilla chips). These are quick and easy, relatively healthy, and go perfectly with a margarita. I'm not sure what else you could possibly want? To make the salsa, combine all the ingredients in a medium bowl. Taste and season with additional salt and pepper if necessary. Set aside while you make the quesadillas. In a medium bowl, mash the avocado with a fork until it's almost completely smooth. Fold in the scallions, cilantro, lime juice, cheese, hot sauce, crab meat, and salt and pepper. Taste and adjust seasonings with additional lime juice, hot sauce, and/or salt. Prehat a 12-inch nonstick skillet over medium heat. Fold the tortillas in half and brush one side with canola oil. On the un-oiled side, scoop about 1/2 cup of the avocado-crab mixture onto the bottom halves of each of the tortillas. Cook a few minutes per side in the skillet, until the tortilla is golden-brown and the filling is heated through. Slice into wedges and serve with the mango salsa. I JUST saw a recipe with crab and avocado and it's my new obsession. Add quesadillas to the mix and I bet this is a fantastic combination!!!! Thanks Josie! Was just thinking yesterday how crab season can't come fast enough! Was thinking about a crab enchilada, but I'll be trying this first. Looks great! These look amazing! I hope I can get my hands on some good crab to make these...yum! These look delicious! I love crab and avocados. I have just fallen out of my chair and onto the ground. YUM. OMG! This looks amazing! I must try this asap! Sigh. 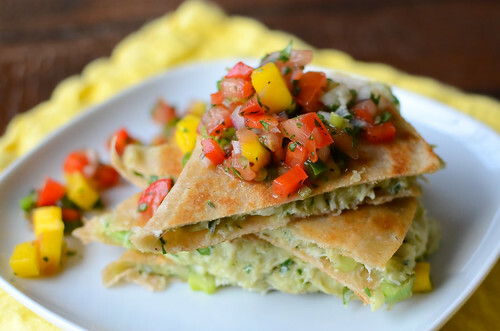 A tropical vacation WOULD be lovely right about now...but until then, these quesadillas will have to do! They scream tropics. ooo this sounds perfect for the summer. I would def grill this! This looks delicious! Im printing it as I type this! I can't wait to try it! Um, yeah.... Not sure what happened there. You fill the tortillas, fold in half, and then cook. Thanks for catching my mistake!